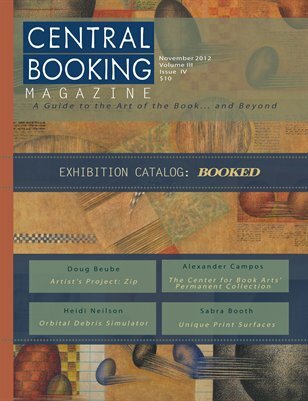 In the November 2012 issue, Alexander Campos shares his thoughts on the political side of The Center for Book Arts Permanent Collection. We speak with Doug Beube about the trajectory of his career in book art and the artist behind this month's trompe l'oeil project “Zip.” Sabra Booth shows us how to print with unique material surfaces from rubber gaskets to sand, while Omar Olivera muses on the New York Comic Con in the latest episode of his graphic series. This issue’s catalog insert explores the exhibition “Booked” at the Williams Gallery Center, Lafayette College, showcasing the range of the book and of CENTRAL BOOKING artists. Jae Rossman writes on the book and its relationship to the body, Rosaire Appel writes on the creation of her book “MAth. is there a problem?” and Jeffrey Allen Price discusses his installation work, heavily rooted in a ritualistic process inspired by nature.